Part 2 has some nice winding back roads. I never posted the smoke out? So much wrong in that video. Not turning the engine off when smoke started pouring out of the rear. Never looking at my gauges / lights, instead looking in the rear view. No worries though, the ending is great. 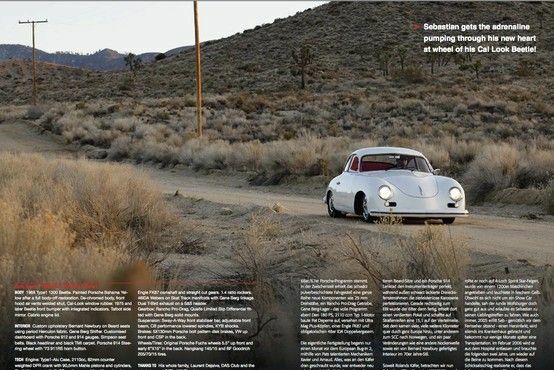 That happened the day before we were leaving for So Cal for the 356 weekend / Air Mighty photo shoot. We still made the trip, with the car, and made the shoot. While waiting on the rest of the crew today I thought I should take a look and sort a plan to fix it. The filter / exhaust run in such a way it couldn't come all the way off or fully unscrewed. Loosen the exhaust, fully remove filter, check / clean filter (System One re-usable), re-install filter, add 7 quarts of oil, turn over engine for a good 90 seconds, turn on key, fires up! Tighten up the exhaust and call it done! Sounds like an easy fix, but really, finding the problem was the hard part. Now the plan is to drive it carefully until after 10/19/2013. Great to hear and good plan. Even your emoticons are exercising Mike. Lol. Please do not share, these are probably going in the mag. I got a couple sneak pics this morning of the issue. Lookin Good Cant wait to get a copy. Mike convinced me Saturday that it would be better to find out if there were any problems (knocking under load, etc.) with the engine sooner than later, so we took it for a +/- hour long drive. The only issue we had was my (still) inability to keep my foot out of it, and the header to head nuts came loose in a couple spots on the final stretch home. I tightened them up, and good as new. Here's some shots from the feature in AirMighty. I assume they are OK to post now that it's out. Any of that look familiar? The first three were in the parking lot of the flea market out by you, the others were taken a few miles East of there out in the sticks. Really the pictures make it look nicer than it is. Driver quality polished up a bit. Time for a tear down w/ some upgrades then it'll be daily driver status, finally! Looks great Amy! I heard it was her wedding gift? Yew that flea market is at Hwy138 and T ave in So Palmdale. Also by the hills of Lake Los Angeles are very common to me too. Very cool to have your photo shoot in my back yard. I need to to get a copy of the mag now. A lot going on, but no progress really. Since day one my Pro Street trans had made some "noise" and I knew it had to come out. I didn't want to mess with it until after my wedding (almost a year ago now) With a baby due (in less than a month now) I figured I should probably get my projects done before I didn't have time to do so. I decided to pull the current engine and trans a month or so ago. I sent the trans to be repaired and have the R&P along with he 4th switched out to match my Salesflap because it does so well cruising on the freeway. While the 200+ hp engine was "cool" it turns out what I really wanted was a more "stock" engine I could hop in a go for long leisurely drives in with no hassles. I planned on buying another 1720cc Porsche engine but not having a core was not cost effective. So I toyed with the idea of using a more streetable 2276cc I had in my shop. I even went so far as to dress the engine to make sure the exhaust, shroud, etc. would fit and work. Then I had a customer see it and want it for his bus project, so I *think* it's going away to him. In the middle of all that I found a Thing with a well built engine, using quality parts for CHEAP. I killed 2 birds with one stone there. Found a nice streetable engine for my 356, and found a birthday present (the Thing) for my wife. I still need to sort out if the 2276cc is going in my customers bus. 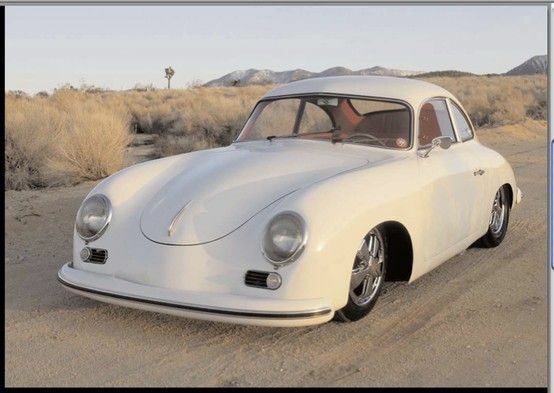 If so, I will do a full "redo" on a new shroud for the 356. I also need to build a replacement engine for the Thing so Amy can drive it. I promised her I wouldn't have it non-running for more than a couple days to do an engine swap / detail. I plan on keeping that promise. Meanwhile I had another deal come up that I couldn't pass up on, but it's taken up a lot of my time. Once I get the trans back I'll make it a roller. Once I have some free time to build Amy a replacement engine for her Thing I'll pull the current engine out and install it. That's definitely an update! Hope to see it up and running again soon. Can I use any pics out this thread? Things have been a bit crazy since my last post. Engines have been going into all sorts of cars, every which way you can think of. I have a few 2276's on hand and the BIG 200hp engine that was in the 356, but I've decided (for the time being) to go back to what I started out with. So with that in mind, I picked up a new "core" Porsche engine last weekend. It's a good base, but I plan on running IDA's still, so it'll be coming apart for a complete rebuild, bump in size, and possibly a few other tricks I'm finding out about on some 356 Outlaw sites. Thanks to Mike (stictlyvwn) for helping me get it unloaded today. Anyway that's all I have for now.